If this is the first time you have started Mail, you will be promoted to enter in your email settings. If you have already been inside Mail, click on the 'Mail' menu &gt; 'Preferences...' > 'Accounts' category > in the bottom left corner, click the '+' sign. 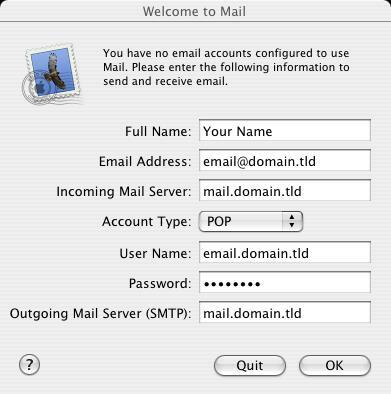 This will bring up the Import Mailboxes dialog box asking you if you wish to import mail from another email client. Click 'No' and it will open up the application fully and show you your 'Inbox', automatically doing a Send/Receive for email. 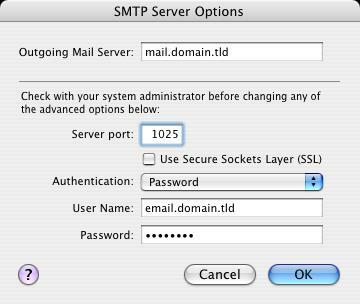 Click on the 'Mail' menu &gt; 'Preferences...' > 'Accounts' category > Highlight the account on the left list > 'Server Settings...' button below 'Outgoing Mail Server (SMTP)' at the bottom of the screen. Change the 'Server port' from 25 to 1025.